Rachel Somers is America's #1 relationship coach-America just doesn't know it. Rachel writes the books, but her Aunt Donna plays the face of the operation. Living in fear of their secret being exposed, Rachel has no choice but to keep up the charade or lose the big money required to care for her father. With the deadline for their next book closing in, Rachel finds herself out of inspiration and running out of time. The last thing she needs is her aunt and publicist concocting a harebrained scheme to join forces with some radio star in the hope it will help deliver the elusive next book idea. Lucas Grant is a star of late night radio-though it's come with an unexpected price of hordes of women who keep calling his sports show to ask him for relationship advice. They make his ratings look great, but they also mean he has to waste hours talking to people like Dr. Donna Somerville about feelings instead of his first love: football. When a big-time producer calls, it looks like his hard work is about to pay off. But the offer comes with a catch-the producer is convinced Dr. Donna is not what she seems and he wants Lucas to discover her secret. To do that, he needs to win over her tight-lipped assistant who holds the key to his success and-he begins to suspect-his heart. Can love find a way through the lies that force them apart? 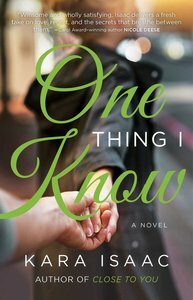 About "One Thing I Know"